Some of the Atacama Large Millimeter Array radio telescopes. The eight radio telescopes of the Smithsonian Submillimeter Array, located at the Mauna Kea Observatory in Hawai'i. 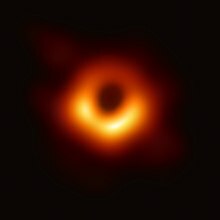 VLBI was used to create the first direct image of a black hole, imaged by the Event Horizon Telescope and published in April 2019. Data received at each antenna in the array include arrival times from a local atomic clock, such as a hydrogen maser. At a later time, the data are correlated with data from other antennas that recorded the same radio signal, to produce the resulting image. The resolution achievable using interferometry is proportional to the observing frequency. The VLBI technique enables the distance between telescopes to be much greater than that possible with conventional interferometry, which requires antennas to be physically connected by coaxial cable, waveguide, optical fiber, or other type of transmission line. The greater telescope separations are possible in VLBI due to the development of the closure phase imaging technique by Roger Jennison in the 1950s, allowing VLBI to produce images with superior resolution. VLBI is best known for imaging distant cosmic radio sources, spacecraft tracking, and for applications in astrometry. However, since the VLBI technique measures the time differences between the arrival of radio waves at separate antennas, it can also be used "in reverse" to perform earth rotation studies, map movements of tectonic plates very precisely (within millimetres), and perform other types of geodesy. Using VLBI in this manner requires large numbers of time difference measurements from distant sources (such as quasars) observed with a global network of antennas over a period of time. Geodesist Chopo Ma explains some of the geodetic uses of VLBI. High resolution radio imaging of cosmic radio sources. Imaging the surfaces of nearby stars at radio wavelengths (see also interferometry) – similar techniques have also been used to make infrared and optical images of stellar surfaces. Definition of the celestial reference frame. Motion of the Earth's tectonic plates. Regional deformation and local uplift or subsidence. Variations in the Earth's orientation and length of day. Maintenance of the terrestrial reference frame. Measurement of gravitational forces of the Sun and Moon on the Earth and the deep structure of the Earth. Measurement of the fundamental speed of gravity. The tracking of the Huygens probe as it passed through Titan's atmosphere, allowing wind velocity measurements. First imaging of a supermassive black hole. There are several VLBI arrays located in Europe, Canada, the United States, Russia, South Korea, Japan, Mexico, and Australia. The most sensitive VLBI array in the world is the European VLBI Network (EVN). This is a part-time array that brings together the largest European radiotelescopes for typically weeklong sessions, with the data being processed at the Joint Institute for VLBI in Europe (JIVE). The Very Long Baseline Array (VLBA), which uses ten dedicated, 25-meter telescopes spanning 5351 miles across the United States, is the largest VLBI array that operates all year round as both an astronomical and geodesy instrument. The combination of the EVN and VLBA is known as Global VLBI. When one or both of these arrays are combined with space-based VLBI antennas such as HALCA or RadioAstron (Spektr-R), the resolution obtained is higher than any other astronomical instrument, capable of imaging the sky with a level of detail measured in microarcseconds. VLBI generally benefits from the longer baselines afforded by international collaboration, with a notable early example in 1976, when radio telescopes in the United States, USSR and Australia were linked to observe hydroxyl-maser sources. This technique is currently being used by the Event Horizon Telescope, whose goal is to observe the supermassive black holes at the centers of the Milky Way Galaxy and Messier 87. Image of the source IRC+10420. The lower resolution image on the left image was taken with the UK's MERLIN array and shows the shell of maser emission produced by an expanding shell of gas with a diameter about 200 times that of the Solar System. The shell of gas was ejected from a supergiant star (10 times the mass of our sun) at the centre of the emission about 900 years ago. The corresponding EVN e-VLBI image (right) shows the much finer structure of the masers because of the higher resolution of the VLBI array. VLBI has traditionally operated by recording the signal at each telescope on magnetic tapes or disks, and shipping those to the correlation center for replay. Recently, it has become possible to connect VLBI radio telescopes in close to real-time, while still employing the local time references of the VLBI technique, in a technique known as e-VLBI. In Europe, six radio telescopes of the European VLBI Network (EVN) are now connected with Gigabit per second links via their National Research Networks and the Pan-European research network GEANT2, and the first astronomical experiments using this new technique were successfully conducted in 2011. The image to the right shows the first science produced by the European VLBI Network using e-VLBI. The data from 6 telescopes were processed in real time at the European Data Processing centre at JIVE. The Netherlands Academic Research Network SURFnet provides 6 x 1 Gbit/s connectivity between JIVE and the GEANT2 network. In the quest for even greater angular resolution, dedicated VLBI satellites have been placed in Earth orbit to provide greatly extended baselines. Experiments incorporating such space-borne array elements are termed Space Very Long Baseline Interferometry (SVLBI). The first space VLBI experiment was on Salyut-6 orbital station with KRT-10 (ru:КРТ-10), a 10-meter radio telescope,which was launched in July 1978. The first such dedicated VLBI mission was HALCA, an 8-meter radio telescope, which was launched in February 1997 and made observations until October 2003, but due to the small size of the dish only very strong radio sources could be observed with SVLBI arrays incorporating it. Another space VLBI mission, Spektr-R (or RadioAstron), was launched in July 2011. The Radioastron project is a radiointerferometer composed of the Spectrum-R space telescope and terrestrial radio telescopes. The orbit height of the Spectrum-R is 390 thousand km, which makes it the longest radiointerferometer to date. The resolution of the system will reach 8 microseconds of the arc. In VLBI interferometry, the digitized antenna data are usually recorded at each of the telescopes (in the past this was done on large magnetic tapes, but nowadays it is usually done on large arrays of computer disk drives). The antenna signal is sampled with an extremely precise and stable atomic clock (usually a hydrogen maser) that is additionally locked onto a GPS time standard. Alongside the astronomical data samples, the output of this clock is recorded on the tape/disk media. The recorded media are then transported to a central location. More recent experiments have been conducted with "electronic" VLBI (e-VLBI) where the data are sent by fibre-optics (e.g., 10 Gbit/s fiber-optic paths in the European GEANT2 research network) and not recorded at the telescopes, speeding up and simplifying the observing process significantly. Even though the data rates are very high, the data can be sent over normal Internet connections taking advantage of the fact that many of the international high speed networks have significant spare capacity at present. At the location of the correlator the data are played back. The timing of the playback is adjusted according to the atomic clock signals on the (tapes/disk drives/fibre optic signal), and the estimated times of arrival of the radio signal at each of the telescopes. A range of playback timings over a range of nanoseconds are usually tested until the correct timing is found. Playing back the data from each of the telescopes in a VLBI array. Great care must be taken to synchronize the play back of the data from different telescopes. Atomic clock signals recorded with the data help in getting the timing correct. in the phases of the signals from tapes B and C respectively (see drawing on right). As a result of these errors the phase of the complex visibility cannot be measured with a very-long-baseline interferometer. The phase of the complex visibility depends on the symmetry of the source brightness distribution. Any brightness distribution can be written as the sum of a symmetric component and an anti-symmetric component. The symmetric component of the brightness distribution only contributes to the real part of the complex visibility, while the anti-symmetric component only contributes to the imaginary part. As the phase of each complex visibility measurement cannot be determined with a very-long-baseline interferometer the symmetry of the corresponding contribution to the source brightness distributions is not known. R. C. Jennison developed a novel technique for obtaining information about visibility phases when delay errors are present, using an observable called the closure phase. Although his initial laboratory measurements of closure phase had been done at optical wavelengths, he foresaw greater potential for his technique in radio interferometry. In 1958 he demonstrated its effectiveness with a radio interferometer, but it only became widely used for long-baseline radio interferometry in 1974. At least three antennas are required. This method was used for the first VLBI measurements, and a modified form of this approach ("Self-Calibration") is still used today. The International VLBI Service for Geodesy and Astrometry (IVS) is an international collaboration whose purpose is to use the observation of astronomical radio sources using (VLBI) to precisely determine earth orientation parameters (EOP) and celestial reference frames (CRF) and terrestrial reference frames (TRF). IVS is a service operating under the International Astronomical Union (IAU) and the International Association of Geodesy (IAG). ^ a b c The Event Horizon Telescope Collaboration (April 10, 2019). "First M87 Event Horizon Telescope Results. I. The Shadow of the Supermassive Black Hole". The Astrophysical Journal Letters. 87 (1): L1. doi:10.3847/2041-8213/ab0ec7. ^ R. C. Jennison (1958). "A Phase Sensitive Interferometer Technique for the Measurement of the Fourier Transforms of Spatial Brightness Distributions of Small Angular Extent". Monthly Notices of the Royal Astronomical Society. 119 (3): 276–284. Bibcode:1958MNRAS.118..276J. doi:10.1093/mnras/118.3.276. ^ Urban, Sean E.; Seidelmann, P. Kenneth, eds. (2013). Explanatory Supplement to the Astronomical Almanac, 3rd Edition. Mill Valley, California: University Science Books. pp. 176–7. ISBN 978-1-891389-85-6. ^ "Radio astronomers confirm Huygens entry in the atmosphere of Titan". European Space Agency. January 14, 2005. Retrieved March 22, 2019. ^ "Very Long Baseline Array (VLBA)". National Radio Astronomy Observatory. Archived from the original on June 11, 2012. Retrieved May 30, 2012. ^ Webb, Jonathan (8 January 2016). "Event horizon snapshot due in 2017". bbc.com. BBC News. Retrieved 2017-10-22. ^ "Astronomers Demonstrate a Global Internet Telescope". Retrieved 2011-05-06. ^ Nothnagel, A.; Artz, T.; Behrend, D.; Malkin, Z. (8 September 2016). "International VLBI Service for Geodesy and Astrometry". Journal of Geodesy. 91 (7): 711–721. Bibcode:2017JGeod..91..711N. doi:10.1007/s00190-016-0950-5. ^ Schuh, H.; Behrend, D. (October 2012). "VLBI: A fascinating technique for geodesy and astrometry". Journal of Geodynamics. 61: 68–80. Bibcode:2012JGeo...61...68S. doi:10.1016/j.jog.2012.07.007. Wikimedia Commons has media related to Very-long-baseline interferometry.